Since 1989, Millennium Hotels and Resorts has been popping up stunning hotels around the globe. Starting out with 6 hotels in Asia, Millennium Hotels has now expanded into the Middle East, the US, Europe and New Zealand, so if you’ve got an adventure in mind, you’re guaranteed a perfect stay in one of the fabulous hotels. With Millennium Hotels, you can ensure that you’ll be right in the centre of the action, closest to the local hotspots and to all the must-do tourist attractions. Explore and unwind, it’s easy to do when you’ve got a charming hotel to enchant you just as much as the location itself. Sterling service, modern amenities and grand decor are but a few of the factors you’ll enjoy in your hotel wherever it may be. It’s no surprise that many of the 4-star stays tempt the likes of celebrities through their doors too. With fine dining and room service available, you’ll be in for a delectable treat or two, while Millennium Hotels also make great venues for meetings and special events like your wedding. Highly rated by all who stay in one of the impressive hotels, browse the blog for features to help inspire your next adventure and make your next stay away one with Millennium Hotels. How do I use my Millennium Hotels discount code? Check out the offers’ page for a huge selection of opportunities to save with Milleniums Hotels. Can I modify my Millennium Hotels booking? You can modify your booking online, do be aware that this may be subject to a cancellation fee. Where is my nearest Millennium Hotel? You can search for your nearest destination right here. 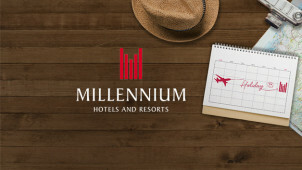 What are Millennium Hotels’ frequent flyer partners? They include Virgin Atlantic, Etihad, Qatar Airways and more. A full list is here. Cancellation policies vary depending on the rate booked. The Lowest Rate is not refundable or amendable, the Flexible Rate can be cancelled by 2pm at least one day prior to arrival. Enter your booking details here to explore your options. Millennium Hotels and Resorts runs a whole host of exclusive loyalty programmes to enjoy. The ‘My Millennium’ rewards’ scheme will let you earn My Points every time you experience a wonderful stay in one of the city hotels. Your points can be transformed into treats to use alongside your Millennium Hotels discount code, so you can dream big every time you book a getaway stay. A stay in the Big Apple is an adventure to truly look forward to, and even more so when you’re planning to stay with Millennium Hotels. Getaway to New York Times Square at the Millennium Broadway or at The Premier and your Millennium Hotels promo code will let get you more for your money as you discover one of the most incredible cities in the world. Stroll through Broadway, First Avenue and the Bronx, there is a never ending list of must-dos in NYC to enjoy!